Aloe hereroensis is easily distinguished from other Aloes. The lower leaf markings, shape of the flower, much branched inflorescence with it's uniquely shaped racemes make identification easy. Aloe hereoensis received its specie name from where it was originally found in Northern Namibia, home of the Herero. Common Names: 'Sandaalwyn' translated it means Sand Aloe, Vlakte-aalwyn means Plain Aloe. Distribution: Aloe hereroensis prefers a flat sandy or stony habitat but it may also be found on rocky slopes. It is widely distributed in dry areas of the Northern Cape and Orange Free State in South Africa. It may also be found northwards into Namibia and Angola. Stem: Stems are not visible due to the plant growing along the ground. 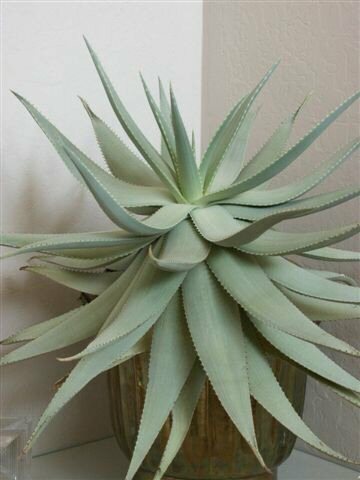 Aloe hereroensis usually only grows as a solitary rosette but it may divide into three heads. Leaves: Leaves are greyish-green in colour and are long and narrow in shape, they are curved inwards near the top which gives the rosette a rounded appearance. Upper leaf surface are marked with faint longitudinal lines and the lower leaf surface is sarsely to densely marked with h-shaped marks, especially in juvenile plants. Both leaf surfaces are smooth. The leaf margins is armed with sharp reddish-brown triangular teeth. Inflorescence: The inflorescence is branched with between 10-20 racemes. Racemes are head-shaped and are wider than long. Flower: The tubular flowers can be red, orange or yellow, they are 30mm in length, the base of the flower is widr than the mouth. Flowering Time: Flowering occurs from June to September. Notes: Aloe hereroensis grows well in an alkaline well-drained soil. Picture courtesty of Jim Simpson.